Microsoft released Windows 10 Insider Preview build 17758 to the Windows Insiders in the Fast Ring on 11th September and then pushed it to Slow Ring on 14th September. As it is mostly a finished and stable build, its now available as ISO/DVD image, so that you can do a clean installation on your PC. How to download the latest Windows 10 ISO for free? Navigate to the official Windows 10 Insiders ISO page and login with your Windows Insider account credentials. Scroll down the page and select the Edition that you like to download. Select the Product Language and click Confirm button. It will list out two ISO images. Select either the 64-bit Download or 32-bit Download, based on your processor architecture (x64 or x86), and start downloading. Please note that the generated links will be active only for 24 hours. You will need to complete the download process within that stipulated time. After that, you will have to regenerate them. 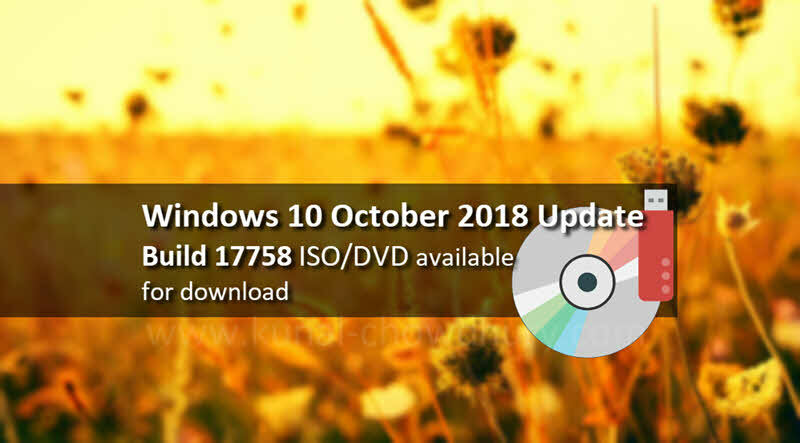 If you have come this far, it means that you liked what you are reading (Windows 10 build 17758 ISO/DVD images are now available for download).